A true testament to the creativity of cyclists and New Yorkers, our calendar includes arts, performance, literary interest, food, adventure, advocacy, competition, rides, tours, activism, multimedia events, films, education, fun, and more --130 events and counting. Events are free unless otherwise noted. We hope you'll continue biking after BikeSummer, too. Many BikeSummer event organizers offer rides all year round. Plus, on August 3, New York is hosting a pro race featuring the best U.S. cycling teams. The 1.2-mile circuit through Lower Manhattan provides great free public viewing. BikeSummer started in San Francisco in 1999 and travels to a different city each year. BikeSummer 2003 is being produced entirely by volunteers from New York-area groups. Volunteers welcome! Leave a message at 212-330-7083. Enjoy BikeSummer! 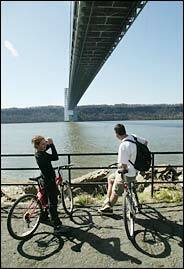 Michelle Vasquez and Jeff Carpenetti reached the George Washington Bridge from Battery Park in two hours. In its modest way, it has been a quest as irrepressible as sailing a ship around the globe. New York's Magellans on bicycles have long yearned to complete a loop of Manhattan Island. The chief obstacle has always been that Manhattan's shores, unlike those, say, of Paris, were designed for commerce and commuting, and only in a few patches for pleasure. But slowly, the city has been hacking out a trail from the jungle of piers, railroad tracks, highway ramps, factories and scrap heaps that ring Manhattan. By this fall, the Department of Parks and Recreation hopes to carve out (or in parts mark out) a 32-mile circuit that will take bikers from the Battery up the West Side, past the George Washington Bridge almost to the northern tip of Manhattan, then down the Harlem and East Rivers and back to the Battery. The loop will not be seamless. There will remain significant detours onto city streets and a few staircases where riders will have to dismount and lug their bikes. But it will get the job done. "Piecemeal it's always going to be," said Ruth W. Messinger, who describes herself as a "fierce bicyclist" and who as Manhattan borough president pushed for the circuit a decade ago. "But bikers are an intrepid lot, and, given these opportunities, they'll stick their neck out, do a little portage and get around the difficult spots." A major spur for the loop has been the popularity of two West Side bike paths completed in the past few years, one that links the Battery and Riverside Park and the other, known as Cherry Walk, that parallels the West Side Highway from roughly 101st to 125th Street. The paths, used also by thousands of joggers, strollers and rollerbladers, allow bikers to savor the shimmering might of the Hudson and the daunting fortresses of Midtown for unbroken miles and have become one of the delights of a rejuvenated Manhattan. In the next few months, a restored two-mile trail, along what was once a blue-blooded trotting track known as the Harlem River Speedway, will create a freewheeling stretch from Dyckman Street down to 155th Street. Patching will also begin soon on a rutted fragment of the Riverside Drive sidewalk that runs from just north of the George Washington Bridge up to Dyckman Street's western edge. Another short segment of parkland has been completed along the Harlem River north of 135th Street and still one more trail is being readied alongside the heliport and ferry terminal on the East Side below 34th Street. Because there are gaps — most notoriously the gerrymander-like route between 125th Street and 145th Street on the West Side — signs calling attention to the New York City Greenway are being screwed onto lampposts and biker silhouettes are being painted on pavements to guide cyclists along trafficked streets. Advocates like Transportation Alternatives and city officials hope the creation of a loop, however imperfect, will open opportunities for more people to commute by bicycle and for the continued invigoration of waterside neighborhoods. They also speak of the democratic mingling of races, classes and neighborhoods that a loop might encourage, something evident any weekend where Upper East Siders bike or jog up to 120th Street and those from Harlem and East Harlem make their way down. "New York City grew up around its maritime history," said Joshua Laird, chief of planning for the Parks Department. "That era is now over and New Yorkers are beginning to discover that this is a city surrounded by water and they want to be at that waterfront." There are plans to carve out more greenway so streets and their automobile traffic can be avoided altogether. Currently 54 percent of the island's waterfront is accessible by bicycle; that will increase to 65 percent by the fall, Mr. Laird said. But bicycle advocates say the United Nations, concerned about security, has proven as difficult an obstacle to a full loop as it was to the Bush administration's Iraq war. The renovation of eight Harlem River bridges, which requires a construction staging area between 125th and 135th Streets, may block another connecting path for perhaps 10 years. Noah Budnick, projects director for Transportation Alternatives, said that he was not pleased that the on-street sections would not be discrete blocked-off lanes but simply white markings on the ground that still expose bikers to traffic. Cyclists have been pushing for a circuit of the island for decades. Ed Ravin, a 41-year-old member of the Five Boroughs Bicycle Club, has a bumper sticker from circa 1980 that calls for a "Bike Beltway Around Manhattan." "The actual loop is mostly symbolic," said Mr. Ravin, who commutes by bike from his home in Riverdale, the Bronx, to his Midtown job as a computer programmer. "However, it does give peace of mind to many bicylists. For 9 out of 14 miles I can look at the Hudson River." In the early 1990's, the Department of Planning drew a blueprint for 350 miles of city greenway that specifically called for a 32-mile Manhattan circuit, and state officials outlined a greenway from Manhattan to Albany that included Manhattan's West Side. Ms. Messinger's office spearheaded the improvement of some waterfront stretches. "Every other American city that has a waterfront did a better job of discovering and profiting from its waterfront," she said recently. Mayor Michael R. Bloomberg, whose deputy for economic development, Daniel L. Doctoroff, is a bicycle enthusiast, breathed new life into the loop when he promised to complete it in his 2002 State of the City Address. He has allocated $4.5 million in the capital budget for completion of the greenway by the fall. There are still negotiations between parks and transportation officials over where some on-street detours will be. Many residents frown on bike paths as hindrances to the inalienable right to double-park. But Tom Cocola, a spokesman for the Department of Transportation, says a bike loop will become a reality. "There's been a lot of attention to it, given the ambition and the beauty of it," he said. "It's going to be a great ride." Urban biker's appropriately abrupt diary: begin tour by checking out familiar landmarks. The wild turkey dubbed Giuliani is still pecking around unharmed in the bushes up from the bike path on Riverside Drive. (Bird seems overfed by West Side liberals, and badly named — more resembling Ed Koch, as mayoral stares and prancings go.) Back on the bike, and zipping past the Amiable Child Memorial (5-year-old lad fell to his death in 1797, when New York was more rural than urban-wild). Soon shifting gears to curl down and around onto one of the modern wonders of Manhattan: the Waterfront Greenway bike path that circumvents the island by shoreline. Splendid. Most shocking, it is perfectly sign-marked; no way to miss a turn. Whoever heard of such consideration in New York? Must be a new and cunning biker's lobbyist at City Hall. You don't need one of those Spider-Man designer costumes or racks of water bottles, as if traversing the Gobi. Scruffy is fine enough on a New York winter morning. "Watch it," works better as a caution to a pedestrian than the imperious "On your right!" that is standard elsewhere. The Hudson, Harlem and East Rivers ripple past, dark waters fiercely defining terra firma. The path unfolds north, east, south, the biker with a sense of pedaling upward into a simple, exhilarating city escape. "Surely nothing on earth of its kind can go beyond this show," Whitman said of his own Manhattan tour, and his summary works as well by bike as by boat. Wheeling up to and under the George Washington Bridge, so high its traffic hum does not overwhelm the slapping sound of the river. Temptations abound: the Cloisters for a medieval detour? The great brownstone side streets of still another Harlem renaissance? The Bronx looms, salt of the city earth, half-finished as ever. The few forced veerings from the shore — down St. Nicholas Avenue, later dodging the United Nations — are a perfect respite: storefront bars can be found for cold beer or hot coffee. Studying passing faces on the sidewalk fuels the race back to more sights on the river. Just across the water, there is beloved, beleaguered Queens, packed as ever with strivers. Green and stony Brooklyn glistens, its spirit arching like its bridge. Sea winds whirl round the jutting Battery, making the bike feel mortal-heavy; but then transcendent light at the sudden sight of distant pedestrians, small and still as architects' pin-people. They stare down on the island's trade center scars. The Hudson mercifully rushes on like time, escaping city history as much as explaining it to the laboring biker. Sights clash in review: the aircraft carrier ludicrously displaced at the peaceful midtown shore. The buckled and rusted skeletons of old terminals leaning wanly toward the river. They dodge extinction uptown, as dedicatedly as the biker. Why Not the Best for the Big Apple? The Bike Helmet as Riot Gear? 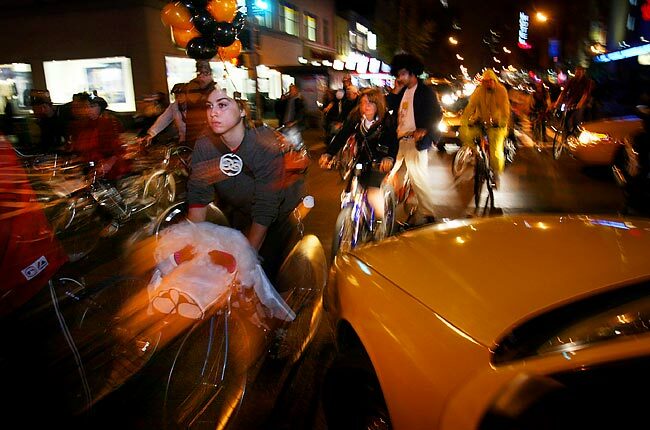 Cyclists in a monthly Critical Mass bike ride blocked traffic on West 23rd Street in Manhattan on Friday night. Richard Moustache, of Maine, outside a Critical Mass party on East Houston Street. Many of those attending the party locked their bikes in a pile out front. Laurie Williams, a mild-tempered graduate student with a tousled mane of curls capped by a bicycle helmet, straddled her neon-green mountain bike, surveyed the gathering crowd in Union Square last Friday night and wondered if she really belonged there. "I love riding my bike, but it is not a political thing," she said as she warily eyed dozens of police officers with plastic cuffs stuffed into their pockets arrayed against hundreds of rambunctious cyclists in Halloween costumes. "It's exercise; it's transportation. I ride because it's an efficient way to get around." Ms. Williams and about 1,000 other cyclists showed up last Friday night to ride in Critical Mass, a monthly bike ride that takes over the streets of Manhattan in a demonstration of bicycle power aimed at promoting nonpolluting forms of transportation. But in recent months the rides have taken on a political tone, and the bicycle has emerged as an unlikely symbol of protest, setting up a clash between a group of cyclists bent on preserving the anarchic nature of the ride and officials in the Bloomberg administration, who have demonstrated little patience for disorder. This clash has some riders worried that the aggressive tactics of Critical Mass - taking over city streets for a few hours a month - is hurting the cause of other cyclists as the police use tougher tactics to control the demonstrations. "It should be about safety in numbers and better conditions for bikers," Ms. Williams said. "It isn't about politics." Before the Republican National Convention hit town in August, few New Yorkers had ever heard of Critical Mass. It is a ride held in hundreds of cities across the globe, but it claims no organizers, though an environmental group called Time's Up! promotes it. It simply materializes once a month. There is no route, the people at the front of the ride decide where they want to go. Riders often block car traffic to allow the ride to proceed quickly, sometimes with the help of the police, who have typically tolerated the ride even if it does snarl car traffic. The point of the ride, participants say, is to emphasize the benefits of cycling and to promote cyclist safety. The rides took place in New York for several years with little incident, until August, when the ride on the eve of the Republican National Convention turned into a huge anti-Bush demonstration with 5,000 riders. The police arrested more than 250 cyclists, and since then they and riders have been engaged in an increasingly tense battle over whether the ride can proceed without a permit. Dozens of cyclists have been arrested in two rides since August, most of them charged with disorderly conduct or traffic violations. When five cyclists who had their bikes seized by the police in the September ride went to court to block the city from seizing bikes in October's ride, the city asked a federal judge for an injunction to stop the ride altogether. The judge barred the city from seizing bikes of people who were not charged with breaking the law and the request for an injunction was denied on technical grounds. But the central issue of whether the ride can proceed in the future is far from settled. While bicycles are considered vehicles under the state vehicle and traffic laws, and riders are required to ride on the street and obey the same traffic laws as cars, the city has argued that because the ride disrupts other traffic it must have a permit. Because bicycles are permitted to ride on the street and Critical Mass is anarchic by nature, with no one claiming to organize it, people who ride in Critical Mass and promote it say they do not need a permit and, in any case, there is no organizer to apply for one. In this legal tussle, the bicycle has emerged as an unlikely symbol of defiance in New York City, something many cyclists have mixed feelings about. The city has had a long and contentious relationship with bicyclists, who were viewed as a nuisance. Yet it is paradoxical that the fight over Critical Mass has emerged just as cycling is gaining widespread acceptance, particularly from City Hall. Mayor Michael R. Bloomberg has emphasized alternative forms of transportation, even buying a bicycle in preparation for the transit strike that never materialized. The city has more than quadrupled the number of bike lanes and paths since 1997, and data from the Department of Transportation indicate that the number of bikers has increased substantially. A bike path looping Manhattan, so long desired by cyclists, has nearly become a reality, despite a few incomplete sections. Indeed, the fight over Critical Mass comes just as the act of riding a bike in the city, once viewed as borderline suicidal, has become, well, rather pedestrian. "For every person that rides in Critical Mass there are 10,000 people who ride bicycles for fun and transportation in New York City," said Noah Budnick, projects director at Transportation Alternatives, a group that advocates cycling. "It is very much part of the mainstream." "Critical Mass is a two-edged sword," Mr. Budnick continued. "On the one hand, it encourages bike riding and people feel really safe while riding in the mass. But on the other hand, it potentially paints bike riding in a very confrontational, not mainstream, sort of fringe light." When the velocipede arrived in New York in the late 19th century, it set of a craze that spawned dozens of bicycle clubs and prompted the city to build the first urban bike path, designed by Frederick Law Olmsted and running the length of Ocean Parkway. On opening day in 1895, it was mobbed with 10,000 riders, forcing the city to widen it. But soon the automobile and later the subway won out over the bicycle as the best way to get around New York, and for much of the last century people who chose to ride bicycles in New York were seen either as quaint eccentrics, like George Plimpton and Murray Kempton, or as radical iconoclasts, like the aggressive bicycle messengers who rose to prominence in the go-go 1980's. "Cycling was, and to some extent still is, seen as transgressive," said Charles Komanoff, a lifelong city cyclist who once ran Transportation Alternatives and is a staunch supporter of Critical Mass. "To get on a bike meant to become a kind of person that many people regarded as alien and even an affront to them." No one embodies New York's schizophrenic relationship with bicycles better than Edward I. Koch. The transit strike in the spring of 1980 put thousands of new cyclists on the streets, and after a visit to China in which Mayor Koch was wowed by the sight of thousands of people plying the streets on bicycles, he ordered a bicycle lane installed on the Avenue of the Americas. But cyclists universally rejected the lane, for various reasons, Mr. Komanoff said, which led the city to remove it and "left a bad taste in mouth of average New Yorkers." "The attitude of most people was, 'what more do you people want?' " he said. " 'We gave you a bike lane and you rejected it.' "
The relationship further soured a year later, when a series of collisions between bicyclists and pedestrians left three people dead and one badly injured, Mr. Komanoff said. In the last few months, debates have raged over Critical Mass on Internet message boards popular with cyclists like MetaFilter and the discussion board for the New York Cycle Club. Some riders say the rides hurt the image of cyclists and make drivers and pedestrians less likely to support cyclists' rights. Others argue that Critical Mass makes an important point about cyclists' rights to occupy space on the city's streets, echoing the Critical Mass mantra: "We are not blocking traffic, we are traffic." On Friday night, few drivers and pedestrians seemed to agree. At stalled intersections, drivers fumed and walkers waited to cross, though some applauded the ride. "Any chance of crossing the street tonight?" a woman screeched at a corner on Park Avenue near the Waldorf-Astoria Hotel. "This is ridiculous." City officials have said they tolerated the ride in past years because the disruption it caused was minimal. But the event has grown, said Gabriel Taussig, chief of the Administrative Law Division in the city's Law Department, and has become unmanageable. "We have never sought to stop the ride altogether," Mr. Taussig said. "But it clearly was an event that required a permit the past few months." But many riders oppose getting a permit. Steven Faust, who has been riding a bicycle in New York City for 50 years and leads rides for the Five Borough Bicycle Club and rode in Critical Mass last month, said getting a permit would send the wrong message. "Where does it end?" Mr. Faust asked. "If I want to ride with a dozen friends to a movie, will we need a permit? It is the principle. Cyclists have the right to use the streets, and we will continue to stand up for that." A struggle between the city and a group of bicyclists intensified yesterday, as the city asked a federal judge, for the second time in three weeks, to stop the cyclists from riding in a large group without a permit. Lawyers for the city asked Judge William H. Pauley III of United States District Court in Manhattan to halt the Nov. 26 group bike ride, known as Critical Mass, unless the riders obtain a permit. The filing came just two weeks after Judge Pauley denied a similar request by the city and allowed cyclists to proceed with an Oct. 29 ride. But that denial was based largely on timing. The city had not given the court or the plaintiffs, five bicyclists, adequate time to respond to the request, Judge Pauley wrote. The city's lawyers filed it just four days before the ride was to take place. A complaint by the five cyclists, filed in October, contended that their constitutional rights and rights to due process were violated when their bicycles were seized. The city also asked that Judge Pauley require the bikers to obtain a separate permit from the Parks and Recreation Department to gather at their usual starting point, Union Square Park in Manhattan. Lawyers for the cyclists say they should not need a permit for the rides, which promote nonpolluting transportation and take place on the last Friday of each month. Bicycles, they say, have as much legal right to the road as cars. Participants in the rides say that they have no formal organization and that the routes are not planned. "They're not just saying you need a permit to ride in the street," said Norman Siegel, one of the cyclists' lawyers. "They are now saying you now need a permit to even meet before riding in the street." But lawyers for the city argue that the rides pose a safety hazard, in part because of the large numbers of riders who attend. In October, they numbered more than 1,000. The city's lawyers said that the riders have run red lights, ignored traffic rules and clogged roads. In October, the police arrested more than 30 riders, a move cyclists have criticized. Police Commissioner Raymond W. Kelly wrote in The Daily News last month that the cyclists used to obey traffic rules, but that around the time of the Republican National Convention, Aug. 30 to Sept. 2, the rides became disruptive. The cyclists' behavior on the rides is "typically what occurs in a parade," said Gabriel Taussig, a lawyer for the city. "We're not saying they shouldn't be able to do that, but rather do it in a way that ensures everyone's safety is protected." In yesterday's filing, a lawyer for the city, Sheryl R. Neufeld, wrote that if the request was too late to stop the Nov. 26 ride, the filing would apply to the group's December ride. The October ride, she wrote, made it "clear that the city is going to continue to face serious public safety problems during the upcoming Critical Mass rides." The cyclists' lawyers have until Nov. 30 to respond to the city's filing, which would be too late to affect the November ride. A hearing in the case is scheduled for Dec. 8, Mr. Siegel said. The sight of hundreds or even thousands of bicycles on busy streets is something that sounds more like Beijing than New York, but on Manhattan's avenues, it has become a regular event. In monthly rides meant to promote healthful and nonpolluting commuting, cyclists have gathered and then pedaled for a few blocks en masse, often up Park Avenue from a parking lot at Union Square. The ride, called Critical Mass, is part of a grass-roots effort that has taken hold in major American cities and hundreds of other cities worldwide. In recent months, though, what for six years had been a generally uneventful spin in New York City has drawn the ire of the police, who regard the bikers as a safety and security hazard and illegal to boot. The city has asked a federal court to halt the rides unless organizers get a permit, as they would for a parade. That could bring the rides to an unfortunate end. Some cyclists have contributed to the showdown with unnecessarily aggressive behavior like blocking traffic and running red lights. Even so, the police seem to have come on awfully strong. Other cities, among them Chicago and San Francisco, have found ways to reconcile bikers and the police. But politics and increasingly frayed tempers have complicated matters in New York. The turning point seems to have occurred before the Republican convention last summer, when regularly scheduled rides - on the last Friday of the month - took on overtones of a political protest. In July, some cyclists headed to the F.D.R. Drive, where bike riding is not allowed. At the end of August, just before the convention, Critical Mass attracted 5,000 riders. As part of a general crackdown on protests without permits, the police detained hundreds of riders - including, apparently, innocent bystanders. Since then, scores more Critical Mass cyclists have been arrested. Norman Siegel, a prominent civil rights lawyer who is representing five riders whose bicycles were confiscated, agrees that Critical Mass riders should obey traffic laws. But he has reasonable concerns about what the police want. By petitioning to bar future rides by groups of even a few cyclists unless they have permits, he says, the city is seeking to pre-empt Critical Mass altogether. Critical Mass has no organizers, and there's no way to know how many riders will participate in any given month. That's a problem if a permit to ride must be regularly obtained. The movement - which takes its name from a documentary film about cycling - spread from San Francisco in the early 1990's through the Internet and word of mouth. Various Web sites keep riders informed, but there is no hierarchy, and there's no formal leader of the pack. Critical Mass by its nature is no leaders and all followers, joined together by a love of cycling. There is no law keeping bikes off the streets. The sudden appearance of thousands of riders obviously poses a challenge, but need not inconvenience others if riders do their part and obey traffic laws as they should. There are no doubt scofflaws among Critical Mass bikers, just as there are among car drivers. But the problem now is that instead of issuing summonses, the police have been arresting the cyclists, handcuffing and taking them away. That is not the best use of New York's finest. In a city like New York, with heavy traffic congestion and overburdened mass transit, bicycles offer an alternative that ought to be encouraged. Bicycles do not create dangerous air emissions. They offer health benefits to the riders. And they're easier on the city's aging roads. Past efforts to encourage commuter biking included the path on Sixth Avenue, a project of Mayor Ed Koch. Few people used it, many complained about it, and it was abandoned. But times are changing. As a way to promote cycling, Critical Mass has legs, in more ways than one. The city should work with riders to defuse their disagreement so the monthly rides can go on, in an orderly, lawful and safe way. What exactly is the point that the monthly ride is trying to get across? MY brother and I bought our bikes from the Russian man who runs a secondhand stall in the flea market at 24th Street and the Avenue of the Americas. Many of the bikes there are of the Irish policeman, sit-up-and-beg variety, manufactured in the 60's and 70's, and it was this type we opted for. Mine was a yellow Schwinn; his an all-black model without any identifying logo, though it did have elegant white tracery around the front fork and mudguards. The bikes cost less than the Kryptonite locks that, we were firmly advised, were necessary to keep them in our possession. "In the suburbs," we were told, "you can get away with something less strong. But in New York, forget about it." The Kryptonite lock is, after the taxi, the signature splash of yellow on New York City's streets. It comes with a chain that reflects light in a dull rainbow, adding credibility to the idea that it might actually be made of Kryptonite. It is not heavy for its size; but it is very substantial. It knocks the paint off the bike when it is unwound from the seat post. We soon got fed up with using the locks; they were too bothersome for short visits to shops or bars, and so we regularly left our bikes unchained. As it turned out, this did not increase the risk of theft by very much. Recent news items have revealed that the Kryptonite lock can be picked in a matter of seconds with nothing more than the plastic casing of a ballpoint pen. The company has offered to replace the faulty model, free of charge, with a new, improved version. In place of securing the bikes to a fence or lamppost, we developed an alternative technique for deterring thieves. This was based on the 19th-century philosopher Jeremy Bentham's theory of the Panopticon. The Panopticon is a prison designed so that all inmates can be observed at any time without knowing they are being watched. In this scheme, actual surveillance is unnecessary; its mere possibility is what keeps the prisoner secure. So it was with the bikes. We couldn't in practice keep an eye on them during various trips into stores and restaurants. But, we figured, left in a place where they might easily be observed, predators would steer clear. They were, after all, old bikes, and not worth much of a risk. The scheme seemed to work well enough. Then, one day a few months ago, when we left a clothing store on Fifth Avenue, we discovered that my brother's bike had been stolen. Mine, also unlocked, remained propped against the shop window where I had left it. I do not want to suggest that my brother was asking for what happened beyond pointing out that it was he who had spent a long time trying on a beige zip-up jacket that appeared to be made from a byproduct of the petroleum industry, which, of course, remained unpurchased. Furthermore, his bike had been parked against the corner lamppost, some distance from the store entrance and, in the quiet early evening, clearly at the outer limits of any Benthamite theory of observance. And so we trudged home, me wheeling the yellow Schwinn, he recalling ruefully the honest, reliable service the missing bike had provided. In the middle of his reverie, I spotted something that looked very much like his bike, chained to scaffolding on the other side of the street. We crossed to investigate. It was his bike; the little scratch on the front fork confirmed it beyond doubt. The thief had evidently chained it up at what he or she thought a safe distance, for later collection. The thief's chain, needless to say, was Kryptonite. We stood on the sidewalk wondering what to do next, casting furtive glances around in case the thief was still in the vicinity. Calling the police seemed like the most obvious option but one that might well require a lot of tedious "procedure." Not to mention the fact that my brother had no evidence that the bike was actually his. We thought of hanging around until the thief came back. But this seemed an even less promising choice, with the possibility of a long wait followed by a confrontation involving abuse or even injury. My brother is what some people might call abstracted. His girlfriend, who is Spanish, says that he lives with the flowers. It is more than likely that, had I not pointed it out to him, he would not have spotted his own bike as we were walking home that day. But behind his sometimes otherworldly demeanor is a keen intelligence. And having had the bike pointed out to him, he devised a scheme of great ingenuity for its return. I WAS at the corner watching a police car disappear down Seventh Avenue when he called out to me. I trotted back to see what was up. "I've had an idea," he said. "Take the chain of your bike and put it on mine, next to the thief's." As I crouched on the sidewalk unfastening my lock, I could not help but marvel at the elegant simplicity of the plan. My brother meanwhile strode off to purchase some paper and a pen from a local store. We left his bike and its two chains with a note stuck under the seat saying: "This is my bike. Take your chain off it or I will call the police." Then we headed home for dinner and a sound night's sleep. When we were young, growing up outside Liverpool by the River Mersey, we would sometimes put down lay lines to catch fish and eels. We would wait for low tide and then go out to the water's edge, where we would secure a long fishing line between two wooden posts driven deep into the sand. The tide, which can rise and fall as much as 30 feet in Liverpool Bay, would soon cover our row of baited hooks. The voyage back to the line when the tide had once more receded was always tantalizing, full of expectation, trepidation, even, given the sort of unearthly creatures that might inhabit the turbid waters off Liverpool's coast. So it was on the return journey the next morning to see what had happened to the bike. Unable to quell my curiosity, I rose early and, leaving Andy asleep, headed out on my own. My heart quickened. The bike was still there. A quick inspection revealed that both the note and the thief's chain had been removed. I called Andy from a nearby phone box, and told him that the eagle had landed. "Oh," he replied in a confused early-morning torpor, "You mean Liverpool won their match?" (We are both fans of the Liverpool soccer team.) "No," I replied. "You've got your bike back." The Panopticon technique is pretty well in ruins now. It took a further big knock the following weekend when my brother and I were sitting outside a French patisserie on Eighth Avenue. With my bike leaned against a lamppost not 10 feet away, a small boy climbed on it and would have made off had I not jumped up. When confronted with his brazen behavior, he merely replied that if I didn't want it stolen, I should have locked it up. "Well, maybe I'll just call the police," I snarled as menacingly as I could. The child mimicked my words in an infuriating singsong and sauntered off. I've never been terribly good at menace. The yellow Schwinn is also out of service. The spot welding that held the back brake to the frame has fractured, and it is now adrift in space, quite useless. The certain cause of this is the repeated dragging over the brake assembly of a thick Kryptonite chain as it is wound and unwound around the seat post. Nothing can withstand Kryptonite, after all, not even spot welding. Colin Robinson is the publisher of the New Press. Bicyclists in New York need your help. From wherever you are in the world, you can aid World Carfree Network member group Time's Up! in their struggle for the right to ride and promote bicycles. It only takes a few minutes to send a letter that could make the difference. Please join our campaign to demand an end to the arrests of cyclists in New York City. Aug 24 - Nearly a year after New York City police preemptively arrested throngs of bicyclists at the kick-off to protests against the Republican Party's National Convention in the Big Apple last year, officers are still rounding up and arresting riders, prompting protests from some groups and the initiation of a worldwide campaign to draw attention to the city's actions. Yesterday, the World Carfree Network, a coalition of people and groups promoting alternatives to automobile transportation, announced that on August 27, it would initiate international efforts to end a crackdown on cyclists participating in community Critical Mass rides. August 27 marks the one-year anniversary of last year's pre-convention round-up in which police arrested hundreds of cyclists. Earthjustice, a US-based environmental law group, joined in support of the campaign. Critical Mass is a loosely organized bike ride that typically takes place once a month in cities across the world. In New York, the riders gather on the last Friday of every month. The body of cyclists has been known to span several blocks at times, snarling traffic as the group rides in celebration their non-polluting mode of transport. Over the last year, the New York City Police Department and other US law enforcement agencies have cracked down on Critical Mass rides, citing blocked traffic and other complications. Earlier this year, New York officials brought a lawsuit against a city-based environmental group, Time's Up, which they accuse of organizing the event. Time's Up denies organizing the rides, though it does support them and other urban cycling as an alternative to automobiles, according to the organization's website. In July, the group issued a set of demands, including the immediate halt to arrests of bikers participating in mass rides and for the prosecution of motorists who strike and kill cyclists. In addition, the group is asking New York commit to educating drivers about bicyclists' rights and to adopt pro-biking policies citywide. 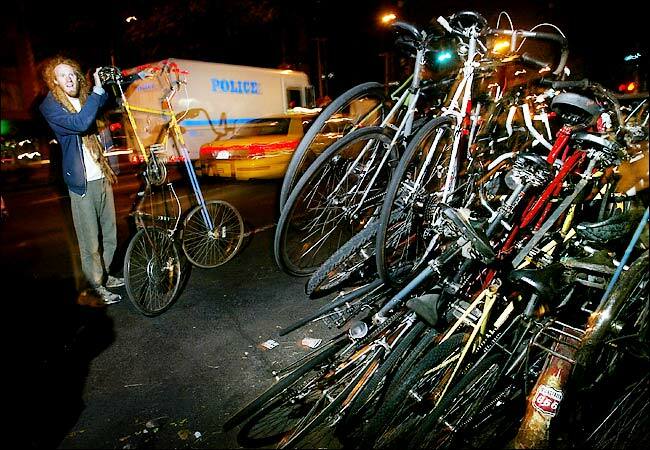 Cycling advocates claim the NYPD has arrested more than 500 critical mass riders in the past year.